Assam Tourism Development Corporation (ATDC) chairman and BJP spokesperson Jayanta Malla Baruah found himself on the back foot while replying to query from reporters here as to why AASU too had joined other protesters against the Citizenship (Amendment) Bill 2016. In response to the query on AASU, Baruah after a pause said that this was because paranoia had gripped all those protesting organizations who were spreading a wrong perception that a large number of Hindu people from Bangladesh would be brought to Assam by passing of the Bill, and that AASU too had got swayed by that idea. 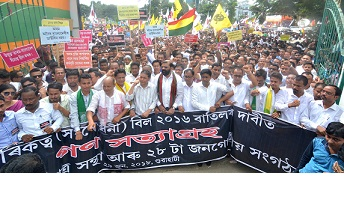 “AASU too has joined the protest on the misconception that Assam’s future would be hampered,” Baruah stated. About the AGP opposing the Bill, he said that the AGP only talked about regionalism, but in practice this was not the case. Baruah alleged that the AGP was “power-hungry” and was in cahoots with Congress and other organizations and was not the least interested in the state’s development. Slamming the AGP, the BJP leader said that AGP was supposedly wearing the shirt of regionalism, having buttons of Congress with thread and stitches of AGP’s selfish leaders. Baruah alleged that Congress was a party of illegal Bangladeshi Muslim migrants whileAIUDF was a party having Jihadi supporters and were out to make Assam an Islamic State. He alleged that the organisations protesting against the Bill were funded by elements that wanted to destabilise the government and were working at the behest of such elements. The spokesman said that the Bill to become a law was a long-drawn process and asked those opposing it to have patience. “After passing of the Bill if it is found that it is not to the interest of Assam then anyone , could approach the Supreme Court like chief minister Sarbananda Sonowal had done for the IM(DT) Act”, Baruah said.